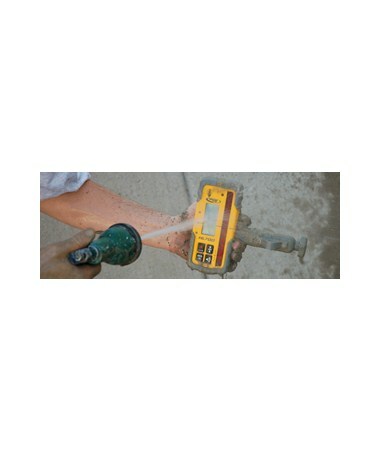 With a working radius of up to 1,500 feet, the Spectra HL700 Laserometer with Rod Clamp and Level Vial is a highly versatile laser receiver for basic and advanced leveling and aligning applications. Featuring digital readout of elevation, multiple dead band settings, and anti-strobe sensor, this laser detector accurately measures elevations across the site and is ideal for use with any red beam rotary lasers. 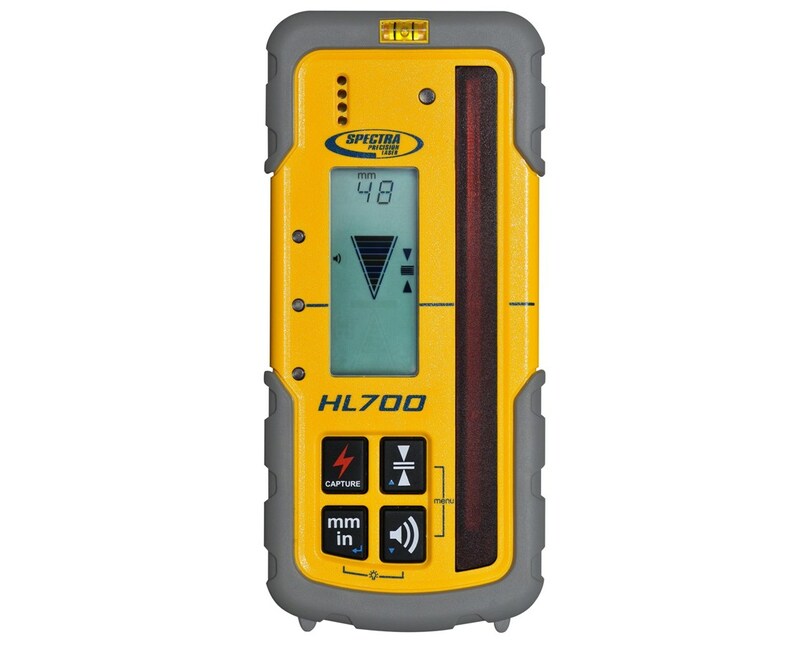 The HL700 features digital readout of elevation that provides a numeric display of ±2 inches on its large front and rear LCDs. This shows exactly how far the elevation is from on-grade and enables you to get accurate measurements without moving the rod clamp. This Spectra laser detector has simultaneous elevation LEDs that signal in low light and over a longer range for easier reading in poor light conditions. 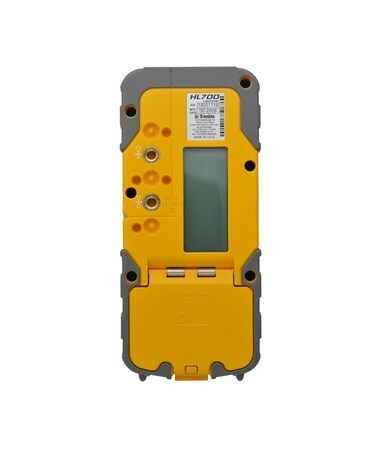 It also has a capture function that remotely takes and retains a measurement when the display is difficult to see. Selectable units of measure are also displayed in millimeter, centimeter, feet, inches or fractional inches. 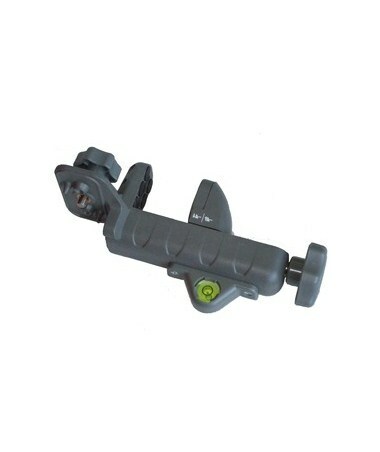 Built-in anti-strobe sensor prevents false readings from light flashes for easier identification of true laser beam signals. 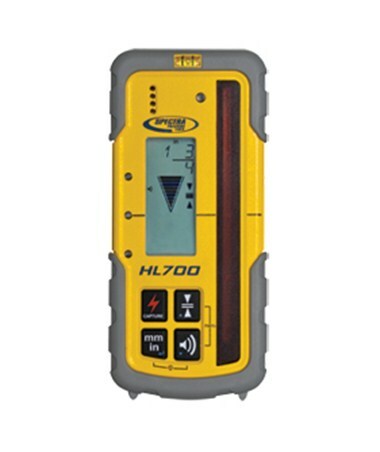 The HL700 laser receiver also has a large 5-inch reception height that quickly acquires the beam and five dead band settings to meet all your job site requirements. 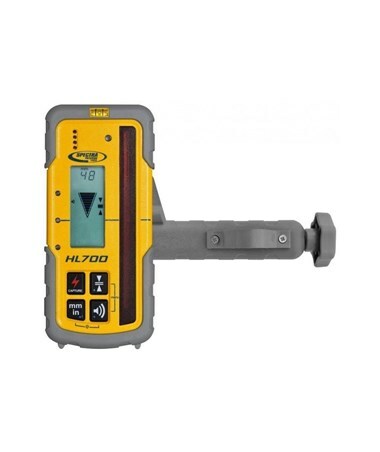 The HL700 can be used as either a handheld or rod mounted receiver for a wide range of applications. It features two clamp positions for cut and fill, while excavation mode puts more reception height and elevation information above grade for higher utilization in digging and staking applications. 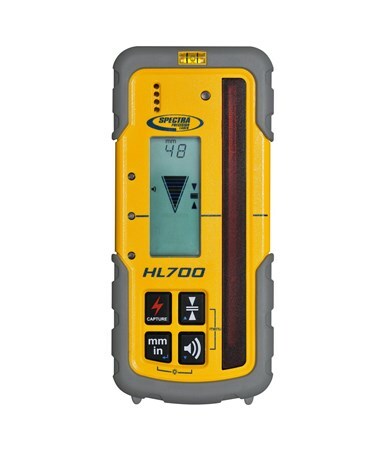 Designed to survive tough construction site conditions, the HL700 Laserometer is dustproof and water resistant to IP-67 and can withstand a drop of up to 10 feet high onto concrete! It also works up to 60 hours using standard alkaline batteries and features automatic shutoff times to reduce downtime due to power loss. 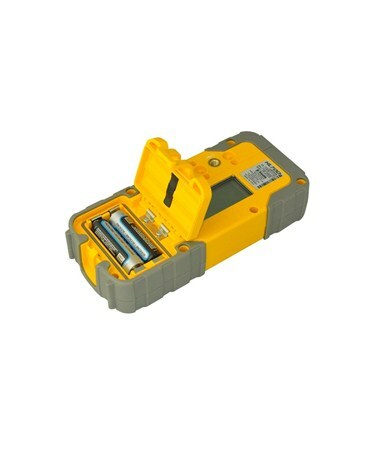 This Spectra laser receiver package comes with a rod clamp with a level vial, two AA alkaline batteries, and 3-year manufacturer's warranty. Working range: 3 - 1,500 ft.